My pretty-in-pink Asus laptop is propped up using one of those ergonomic contraptions (and it’s also elevated using a coffee table poetry book). So I work on a separate keyboard and with a cheapo mouse I brought over from the States. But for a cheap mouse, it’s pretty good. I use a loop scarf that I crocheted to cushion my mouse hand and wrist. A friend gave me the now frayed pink mouse pad that I use. He most likely gave it to me because he didn’t have any use for a free pink mouse pad. I bought a new one, but it’s too slippery. I like pink. Surrounding my laptop are my speakers. My subwoofer is heavy, cumbersome and takes up a corner of the desk even though I have one of the speakers on top of it. So, let’s take a look at these speakers for a moment. I bought them from friends who were moving for about 1000 baht which is roughly $30 and they are one of the best purchases I have made. I love having a quality sound system. On top of my left speaker is a small desk calendar. Even though I hate clocks and don’t like to know the time (unless I have to), I like knowing the date. Electronic calendars don’t have the same feel. I like writing things on my calendar and seeing the overall month picture. On the right, there is a little rubber gecko on the woofer that my b/f and I bought when we were at a local market. Thais are terrified of geckos and tokay lizards so we thought it would be funny to have them thoughtfully placed around the house. On the right speaker sits a tiny round basket and glass elephant that my friend Helen gave to me when we were living in Ecuador. It was a birthday present. That birthday was great because my dear friend Jamie and I had a lovely breakfast and then went to the Cuenca Panama Hat Museum. Later that day, friends showed up at Hotel Alcazar for high tea. It was a first for me. We don’t have high tea in Hawaii, yo! Not, at least, when I was growing up. The day ended with me stopping by landlady’s granddaughter’s confirmation at the iconic Cathedral of Immaculate Concepcion. 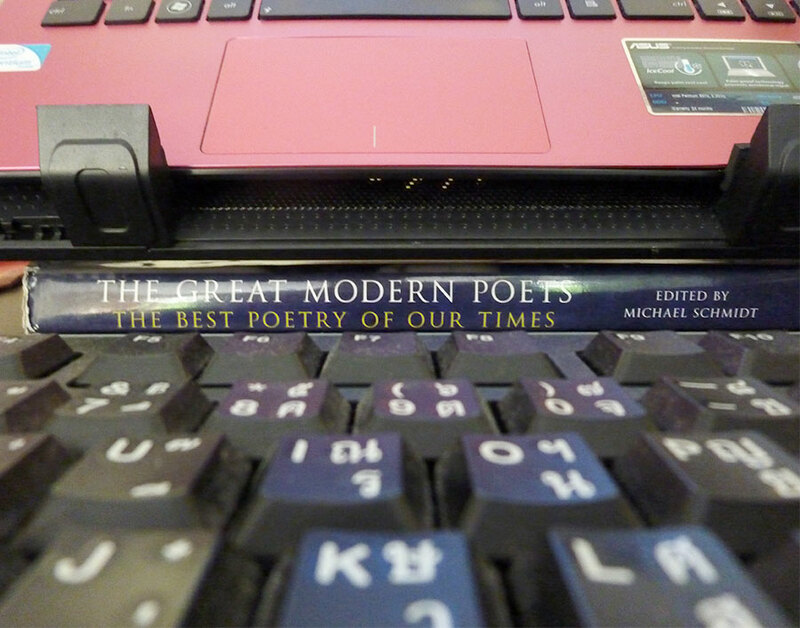 All my notes and outlines from my friend Sandra’s poetry classes are on my desk, too. If I ever need inspiration, it’s not far away. And sitting on top of that stack is my journal. Of course, I have a colorful array of pens and lip balm, as I cannot be without my chapstick. I got into the habit when I lived in Colorado. I guess I’m addicted. Okay, I’m addicted. My coffee mug (another birthday present) and or a glass of water is always on my desk. Since I just moved, I’m using the desk that was already in the apartment. Standard dark brown, matches my other wooden desk of not very large proportions. That desk has the printer and teacher stuff. Blah. I still have to organize it. Don’t make me do it yet. Next Post What’s your comfort food? Sounds like a very neat desk you got there, Lani. I thought I was the only one who elevated my laptop! I elevate it using a CD case as I like my keyboard to be slightly slanted, and this actually helps the hot air to escape from the air vent at the back. Nerdy, I know. Well, then, I hope you get some rest super soon. I’m on vacay, so I’m in relaxation mode and really enjoying exploring our new neighborhood. So I have carefully consider my reply because I want to do it correctly. I am eagerly writing this because my support for adverbs is unchanged and cannot be easily undone. If I were speaking this it would be said fast and loudly, adverbs totally rock! So as I try patiently but quickly to answer your assault on lovely adverbs I find myself quietly fading from my need to write this silly response. Oh yeah, your desk sounds cute while mine is not. A laptop, DVD’s, coffee mug, speakers, a Buddha candle holder and a “Buddha’s Brain” book. My desk at home is a kind of mess. At work, not so much, but a lot of the stuff aren’t even mine, ha ha ha!!! Somebody else’s desk does not have enough space so his stuff are squatting on my desk. My desk at the boarding house…What desk??? None, nada. Oh lordy. I could not be so kind! I would more likely take up too much space at work than less! 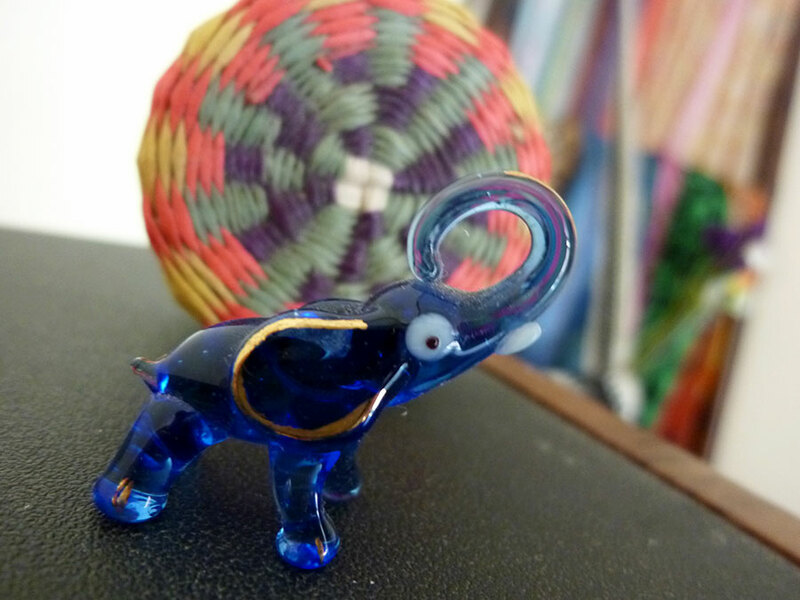 I like the blue elephant – nice touch. I think you have to have a trinket on there somewhere just to keep you anchored sometimes. I have a love/hate relationship with my desk, which is a weird thing to say about any kind of furniture. Mine right now is an old, old fake wood one – I had a lovely, enormous white one at my parent’s house before we moved, but it was too big to take. I miss it. I have a weird relationship with clutter too. I’m the type who needs to have a small amount of it, but has bought into the idea that clutter is EVIL, man. So I constantly clean and then pile up, clean and then pile up. I need to find the equilibrium. Good luck on organizing! It’s therapeutic, but very put-off-able. Yeah, clutter. I think because I move a lot it’s a natural way to keep clutter down, but since I’ve been in Thailand for years now, I’ve acquired a lot of stuff = clutter. 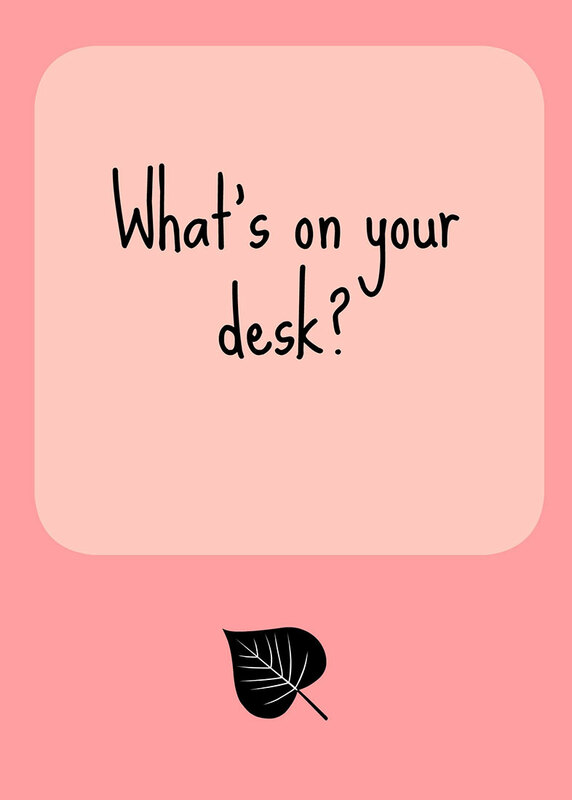 Why do you love/hate your desk? I have my laptop at a level that my arms go straight from my elbows – no carpal tunnel aggravation that way! I think the biggest battle is finding what works best for you on your desk and it looks like you’ve found it! Have a great week. I can’t believe I’m finally visiting WOYWW posts and here it is Sunday.